Global Institute of Management and Emerging Technologies (GIMET) and Global Institute of Management (GIM) are the two new centers of higher education which have come up on the educational map of the State of Punjab. 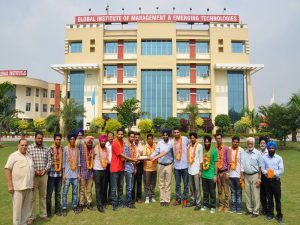 Being run under the aegis of Guru Har Rai Educational Society in Amritsar, Global Institutes have carved an enviable niche for themselves in a short span of just three years. The Management is a strong votary of TQM philosophy and all endeavours are being made to bring up these Institutes to the level of national and international institutions of higher learning in the streams of engineering, technology and management. Placements: The ultra-modern Training and Placement Cell of Global Institutes comprises of audio-visual aided air conditioned interaction hall, career-counseling offices with WiFi facility of internet, Group Discussion hall and Personal Interview rooms. The cell is proactive and is providing necessary training to students for job interviews and also inviting top national and multinational companies for the campus placement of students. The Training and Placement Cell also looks after the interests of the students and regularly arranges industrial visits and guest lectures of professionals from industry and industrial visits for the students. It also organizes a number of other activities such as interdepartmental quiz competitions and makes arrangements for the students to undergo industrial training in various Multi-National Companies. Campus: Global Institute of Management and Emerging Technologies (GIMET) and Global Institute of Management (GIM) are the two new centers of higher education which have come up on the educational map of the State of Punjab. Being run under the aegis of Guru Har Rai Educational Society in Amritsar, Global Institutes have carved an enviable niche for themselves in a short span of just three years. The Management is a strong votary of TQM philosophy and all endeavours are being made to bring up these Institutes to the level of national and international institutions of higher learning in the streams of engineering, technology and management. Central library: There are two well equipped libraries, one for the Engg., MCA & MBA students and the second one exclusively for the MBA students.. There are more than 20,000 books purchased from the reputed publishers along with a large number of magazines and National/International journals and Newspapers. Both the libraries are “E-Libraries” and have the facility of e-books and e-journals. Hostel: There are two newly built separate hostels for boys and girls. The hostels have been constructed with the latest architectural design making each room as an independent entity. Special care is taken for health of the students. No effort is spared to provide homely environment to the hostlers. Special arrangements for indoor and outdoor games like Table Tennis, Badminton, Cricket, Hockey, Football, Volleyball etc. are available. Principal’s Residence- For keeping a vigil and maintaining a proper discipline in the hostel, Principal’s residence has been constructed close to the boys and girls hostels.